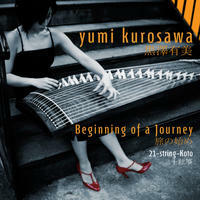 Yumi Kurosawa: Melodic and mixed world tunes on japanese koto. 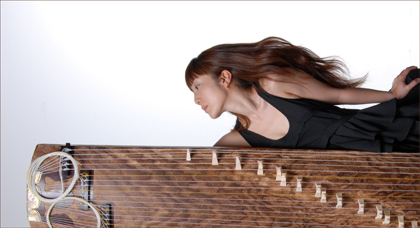 Yumi Kurosawa was born and raised in Japan and began to study Koto when she was three. She received first prize at the National Competition for students in 1989 and 1992, and a scholarship from The Agency for Cultural Affairs of Japan in 1998. Yumi played in the Prague Cello Ensemble Concert at Suntory Hall, Tokyo in 1996 and the NHK Broadcast TV program, Genjimonogatari-WAKANA, in 2000. As well as extensive performance in Japan, in 2002 she moved to New York, where she held her concert at Weill Recital Hall, Carnegie and continued to play in Japan as well where she premiered Koto Concerto Genji (composed by Daron Hagen) as a soloist, as well as with the Orchestra of the Swan in UK in 2011. Yumi has played this piece several times, collaborating with many genres of artists at the Apollo sound stage, Joe's pub, Highline ballroom, and as a member of the Bella Gaia ensemble. Her first original CD, Beginning of a Journey, featuring her own compositions, was released in 2009. She also studied computer music at the computer music lab when she was attending Keio University, creating songs with computer sound as well. She has received great concert reviews several times in the New York Times, The Washington Post as well as many others. Yumi Kurosawa lives in New York, USA. Tagged as: World, Other, Hammered Dulcimer, World Influenced. Fiddle Whamdiddle: foot-stomping, heart-pumping, head-bobbing music that snags audiences and reels them in!